Stock status is current as of 4/26/2019 3:45 AMET. 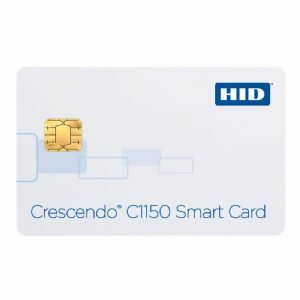 Crescendo C1150 smart card provides end users with one smart card for accessing logical and physical resources, eliminating the need to carry multiple credentials or remember multiple passwords or PINs. For logical access, the card can be used for secure login to workstations and laptops, as well as web-based applications. The card supports strong authentication for VPN access as an alternative to one time password (OTP) tokens. C1150 smart card provides document and email digital signature services and can be used to protect critical data during transmission between trusted parties or for data at-rest. The C1150 is available as a hybrid card with a contact chip and one or several RFID chips for physical access. The smart card leverages world-class contact chip technology that includes a high output co-processor to deliver maximum performance for cryptographic operations.